Only in Erie, Pa. in the course of one day can one go to two charitable events?one involving the police, gambling, and firearms and the other involving a ministry of women who have vowed to serve God. Only in Erie, Pa. in the course of one day can one go to two charitable events—one involving the police, gambling, and firearms and the other involving a ministry of women who have vowed to serve God. What I'm referring to here is the Fraternal Order of Police Memorial Gun Raffle (at Rainbow Gardens) and the Sisters of St. Joseph Neighborhood Network "Guess That Tune" Gala (at the Bayfront Convention Center). Both were held Saturday, March 10 in the afternoon and evening, respectively. I'm sure the Sisters probably aren't thrilled with the idea that I'm writing an article that promotes their organization and incorporates firearms, but the purpose of this is just to shed even more light on why our city is far more interesting than we sometimes make it out to be. Plus, there's something personally enriching, no matter how big or small, to trying anything…at least once. This comes solely from the female perspective, as I was pretty much the minority at the gun raffle. Not that I minded, of course; in fact, I often enjoy being the one that stands out in a crowd—for those of you that know me, I'm sure this is a shocking revelation to you. But whether you're pro 2nd Amendment, this event still served a greater purpose—aside from the proceeds being donated to charity, the event is intended to educate and promote one of our greatest civil liberties. Plus, who doesn't like free beer and small games of chance? And even if you don't like guns—and you manage to win one—imagine the money you could make selling it. Add to that a spirited musical game including 500 of your closest friends, offering three rounds of hummables that include a handful of notes played by Sister Lucille on an upright piano, a few bottles of wine at the table, chocolate and dessert, and you have…well… one interesting Saturday. Aside from a live and silent auction, grand prizes for winners at the "Guess That Tune" gala were awarded from LaBella's Restaurant (1st place), Erie Beer (2nd place), and Larry's Central Market (3rd place). 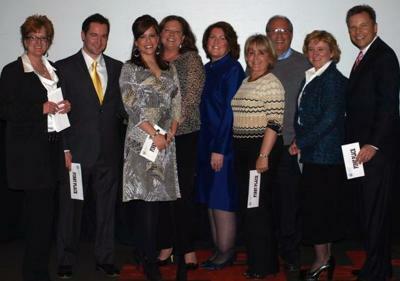 And just to give you an idea of those I was sitting with that lovely evening, we were all vying for second place. PNC Bank took first place (again), and we, well, we didn't win anything…at all. "Guess That Tune" attendees, included: Honorary chair couple Tim Annalyn Shuttleworth; Ruth and Jay Alberstadt, Scott and Stephanie Nick, Alison Scarpitti, Matthew Good, Chuck Scalise, Paul Lukach, Art Martinucci, Bob and Barb Sambroak, and Shay Meinzer. These types of events are just another part of the charm and character our great city brings to us. When we talk about nothing to do in Erie, this is ironically part of the reason we say this—because we almost want to mock the idea that only we could have a gun raffle and a semi-formal event in the same day. But if we start embracing all things Erie, perhaps we'll all find days like these are far more interesting than taking an extended weekend away to your favorite locale.